The first android in the Western World, a completely mechanical figure which simulated a living human or animal, operating with apparently responsive action, is believed to have been constructed in 1525 by Hans Bullmann (?-1535) of Nuremberg, Germany. Bullmann actually reportedly produced a number of extremely ingenious figures of men and women that moved and played musical instruments, for which Ferdinand I, the Holy Roman emperor, summoned him to Vienna, for whom Bullmann produced a variety of novelties before to return to Nuremberg. 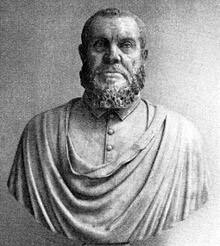 Bullmann was an ingenuous master locksmith and mechanic, who is known also to be the first to set up a true astronomical clock and to invent the letter lock. Unfortunately, neither a working mechanism, nor a description of his devices survived to the present time. At least one of automations of his contemporary however—the Italian/Spanish inventor and clock maker Juanelo Turriano (Gianello Torriano) (1501-1585), namely the so called Lute Player Lady automaton, created in the late 1550s, did survive to the present and now is displayed in the Kunstkammer of Kunsthistorisches Museum in Vienna. The height of the Lute Player automaton (see the lower image) is 44 cm. Though no longer able to actually function, it is said to move with small tripping steps, strumming the lute with its right hand, and turning its head from right to left. It can advance in a straight line, or follow the path of a circle. Juanelo as a diversion also wanted to create anew the ancient statues which moved and, on that account, were called automata by the Greeks. He made a lady more than one tercia high who, placed on a table, dances all over it to the sound of a drum which she meanwhile beats herself, and goes round in circles, returning to where she started from. Though it is a toy and fit for mirth, it is nevertheless a great proof of his high intelligence. Juanelo Turriano (born as Giovanni Torriani in the Italian town of Cremona in 1501), was known to be very skilled in the clockwork and mechanics from his teen years. In late 1520s Charles V, the Holy Roman Emperor, sent word to major cities that he needed a skilled clock maker who could repair the astrarium in Padua, built in the 14th century by Giovanni de' Dondi. Torriano was hired for the job, and upon inspection he came to the conclusion that the clock was rusted and worn beyond repair. He then decided that he was going to build a similar clock, and it took him 20 years to design the clock of 1800 wheels, and then 3 and half more years to make it all by hand. Charles V called Torriano to Spain in 1529, where he was appointed as a Court Clock Master and later as Matemático Mayor under the name Juanelo Turriano and worked and lived in Toledo until his death. When the infirm Charles V abdicated his throne in 1555 and retired to the monastery at San Yuste, Torriano accompanied him and devoted himself to averting the Emperor's moods of depression by creating little automata for his diversion. Tradition relates that Turriano's little figures often appeared on the dinner table after the Emperor's meal in the form of armed soldiers which marched about, rode horseback, beat drums, blew trumpets, and engaged in battle with lances. At another time Turriano is said to have released little birds carved of wood which flew about the room, out of the windows and returned, to the great disapproval of the Father Superior, who considered them to be works of the devil. 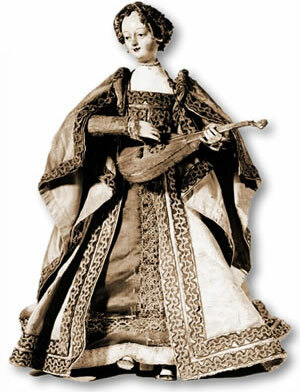 It seems the most famous invention of Torriano, the Lute (mandolin) Playing Lady automaton was built namely for Charles V between 1555 and 1558, when Charles V died. It was extremely lifelike in its motions for the times automatons. Besides the music playing, the automaton could walk and tilt her head. When Charles V died in 1558, Torriano entered the service of his son Philip II, where he further distinguished himself with works of hydraulic and civil engineering. It seems however that the Emperor Philip II did not have his predecessor's love for automatons, so Torriano found other ways to work. His final project was a massive water delivery system, so called Artificio de Juanelo, which was to carry 12000 liters of water a day from the River Tagus to a height of almost 100 meters, to supply the city and its castle (Alcázar). The contract was made for the construction of the Artificio, however the contract was never properly upheld. Torriano was attributed also with the invention of history's first known gear-cutting machine and with a significant role in the calculation of the calendar reform of Pope Gregory XIII in 1582. 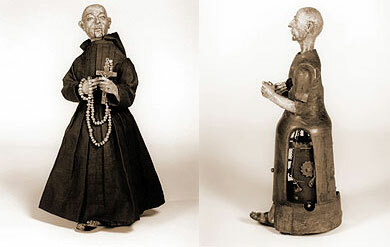 In the Smithsonian Institution in Washington there is a sixteenth-century automaton of a monk (see the lower image), which some historians believe was made by Gianello Torriano around 1560 (while others attributed it to Hans Bullmann). The so called Clockwork Prayer was made of wood and iron, 39 cm in height. Driven by a key-wound spring, the monk walks in a square, striking his chest with his right arm, raising and lowering a small wooden cross and rosary in his left hand, turning and nodding his head, rolling his eyes, and mouthing silent obsequies. Every once in a while, he brings the cross to his lips and kisses it. Amazingly, after some four and a half centuries, the automaton remains in good working order. A legend is told that the King Philip II, praying at the bedside of a dying son of his own, promised a miracle for a miracle, if his child be spared. And when the child did indeed recover, Philip kept his bargain by having Gianello Torriano construct a miniature penitent homunculus.